Many people are trying to incorporate their children in their vacation plans. After all it is difficult to find childcare for that period of time, and spending time as a family in a new location is a fantastic learning experience as well as a bonding experience. However, traveling with your children is not the same as travelling alone, as there are additional considerations to take into account. 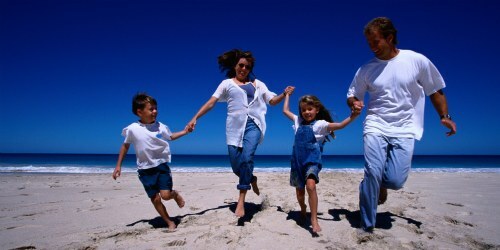 By following these few guidelines, you and your family can have a great and hassle free vacation. Try to choose a destination that can be enjoyed by all members of the family. Not all the activities have to be geared towards children, but there should be some things that the child can look forward to through the day. If, for example the adults want to do something through the day, the child can choose the restaurant to eat at dinner. By giving everyone an opportunity to be involved in decision making, they will all enjoy the trip more. If you are not sure of kid friendly options, be aware that some travels providers, such as Thomas Cook offer special vacation packages for families with kids. Sure, we would all love to see everything there is to see at our destination. But family vacations cannot be go, go, go. Give yourself extra time when catching transportation such as trains or planes. It is better to arrive early then to be rushing through different airport terminals with your child. While at your holiday remember to have some down time every day. This will keep people from getting too tired and grumpy. It may be a good idea to decide that after dinner everyone just relaxes in the hotel, or make the morning more relaxing. Travelling with a family can be very expensive. Therefore it is vital to look for deals before you head out the door. Why not save money on breakfast, by choosing a hotel which includes breakfast in the price of the room? Many hotels have rooms large enough that the parents can stay with the kids and save a lot of money that way. There are also numerous attractions throughout the world that have family days with discounted admission or even free admission on certain days. By researching ahead, you can try to organize your days to see these sites on the cheaper days. Travel often involves a lot of wait times. You wait in the airport, you wait on the plane, and you wait in lines at attractions. Not all kids can handle all that very well. This is why many parents choose to carry small books with them, or small video game devices which will keep the child occupied during those awkward times. Carrying extra snacks is a good idea, as it is not always possible to grab food on the go, and no one is very happy while, hungry, especially kids. By taking a few precautions everyone can have a great family trip.